As a practicing painter, I know that don’t get out to galleries enough but lately, I have been trying to get better about that. I haven’t been very active with my own blog either, so providing a wrap up after one of these tours feels like the right thing to do. Yesterday we needed to run into town for a couple of things. Our first stop was Dupont Circle to take care of some details for Lori Anne’s upcoming solo show. Just down the street we stopped into Cross MacKenzie, a little hallway like gallery that I had never noticed before. Massachusetts-based artist and writer Lyn Horton was showing a number of small to medium-sized drawings on paper with a large wall drawing installation on the back wall. Horton, who received her MFA from Cal Arts in the mid-70s, spending some time executing Sol LeWitt’swall drawings. Horton is also a noted jazz writer, covering some of the contemporary improvised music’s most challenging performers such as Leo WadadaSmith to others on the fringes like DJ Spooky and Thurston Moore. 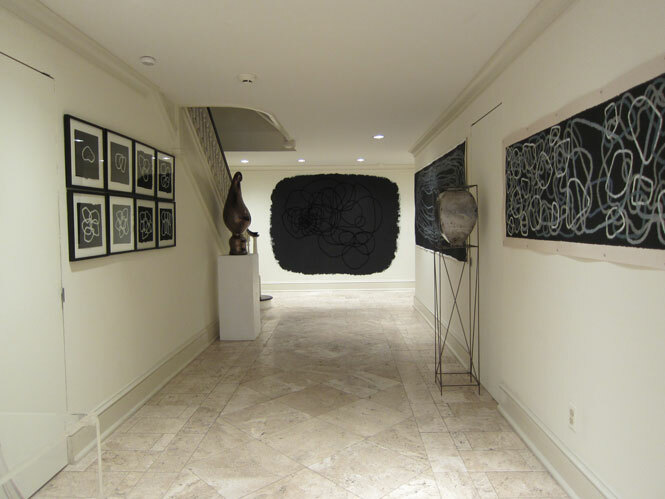 Her drawings feature looping, interconnected white and gray lines on black surfaces. Many of these works have long, tangled strands while other consist more of interlocking shapes. There is a looseness that does provide a link to LeWitt and the improvised music Horton writes about but something about the marks suggest a more studied, deliberate nature. In checking out Horton’s blog, The Paradigm for Beauty, I became more intrigued since she covers a lot of the musicians I was listening to in the 90s and still play in the studio from time to time. Unfortunately, yesterday was the final day of this show. Next stop was Gallery Plan B and a show of new work by Sheep Jones. Plan B is one of my favorite area galleries. They consistently show work that surprises me. Often the images online will lead me to expect something different that what I actually find. In this case, the images used on the gallery’s website, had that sort of boxy, pallet knife look that I generally run away from as fast as possible. In person, nothing could be further from the truth. The surfaces of these painting were simply gorgeous. 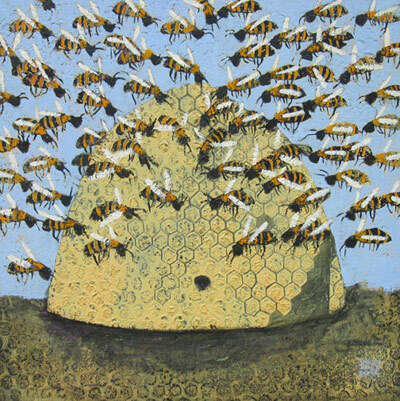 There were a few botanical paintings, some figures, some paintings of roads and intersections and a grouping on the back wall which surrounded a good-sized painting of a beehive with numerous small paintings of bees. We’ve all seen shows where an artist has some sort of style and then tries a bunch of different themes playing to a wide variety of possible interests. For me, I quickly associated many of these paintings with the dreaded human activity of working. Work can be direct, hands making things or working the earth to help produce its bounty. For most of us though, work is less tangible. We get up early to drive to our jobs then drive back home again. I get this feeling from the wonderful paintings of roads and power lines. The intense activity of a beehive, where everyone has a job to do, illustrates on a micro level the interconnectedness of human activity. Across the street, we stopped in at Hemphill for William Christenberry’s show. Christenberry tends to mix a lot of elements and you're never quite sure what he will show. This exhibition contains paintings, constructions, found objects and of course, photography. There is even a holographic Klan Room piece on view as well. Though I never met him during my time at the Corcoran, I’ve always been intrigued by his work. 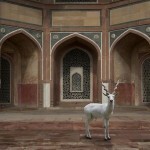 In the same building, the lush digital photo-imagery of Karan Knorr was on view at Adamson. The large-scale images collaged animals and birds into interiors in Mughal and Rajput palaces, mausoleums, and holy sites in India. I was particularly drawn to Witness at the Tomb of Humayun. 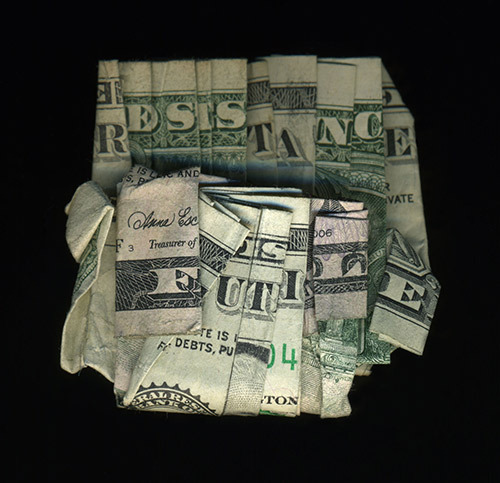 Our final stop was Civilian Art Projects where Dan Tague’s show: "Independence in the Age of Decadence" was on view. 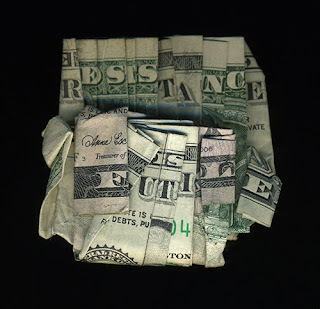 I didn’t know anything about Tague but thought his pieces that use folded and crumbled paper money to have its printed text to spell out such phases as “The Kid are Alright” or “Resistance is Futile” looked pretty clever. Now, I generally scoff at clever since once you’re on to it, its over. Tague’s work had more going on than simply witty messages. I spent a little time looking at Tague’s US Department of Civil Obedience work that was shown in New Orleans, where he lives and works. The video that accompanies the show has Tague coming off like a Stephen Colbert-like community organizer. It is unclear how much of this may have actually been done and how much is just made up and in the end--it didn’t really matter. We were surprisingly drawn into this show. It must have been an odd sight to see a family of three standing in small bathroom listening to Tague’s audio installation of statements being read in a straightforward manner. Check this one out.